~ These machines produce an excellent effect with amny uses for show, events & parties..
~ These machines are fitted with a 13 or 16 amp plug. The peasouper is a lightweight yet powerful machine, the unit has a capacity for 9kg's of dry ice (solid carbon dioxide) this give approx 5 minuets of fog production. The fog flow rate is controlled by a four step ratchet system which lowers the basket of dry ice into the boiling water tank below, the fog then exits the machine from the front nozzle. Ducting can be supplied to send the fog where required. Dry ice can be purchased from various depots of which we can advise. For answers to some Frequently Asked Questions please click here. 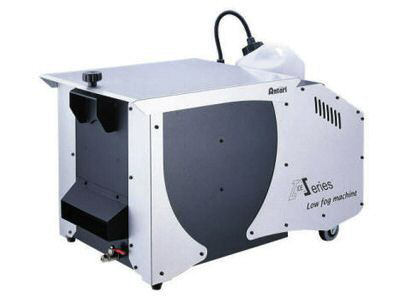 This revolutionary machine produces the ever popular, low lying "heavy" smoke of a dry ice machine, without the inconvenience of dry ice or the potential health hazards caused by dry ice. You can place up to 3 kg of standard ice into the ice chamber to cool the smoke produced by the built in smoke machine. Then watch the floor disappear in ankle deep smoke. 3 kg of ice placed in the ice chamber can last up to 3 hours or 60 minutes with constant use. The machine features a melted ice drainage outlet valve. Ice is supplied by the user. 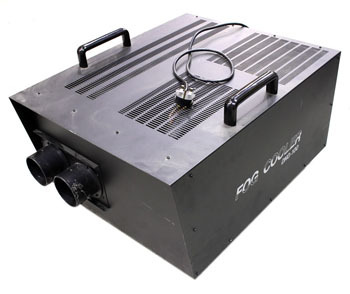 The DNG converts fog from a standard fog machine filled with low smoke fluid into a floor-hugging could of white fog that is almost virtually similar to that of dry ice, without the inconvenience of handling dry-ice. 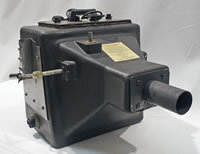 Simply plug the unit in connect a standard fog machine to the rear and after 10 Minutes you are ready to go.